If you have a Kindle Fire, you’ve only got one official source for Kindle Fire apps and that is the Amazon Apps store. The Amazon Apps store has a lot of apps but it has way too many games for me and not enough practical apps. If you have a Kindle Fire, you probably already know you can’t get apps (by default) from Google Play (Google Android Apps Store). So what other choices do you have? You have a few. But my favorite place to get “non-official” apps for the Kindle Fire is GetJar – http://getjar.com/ . 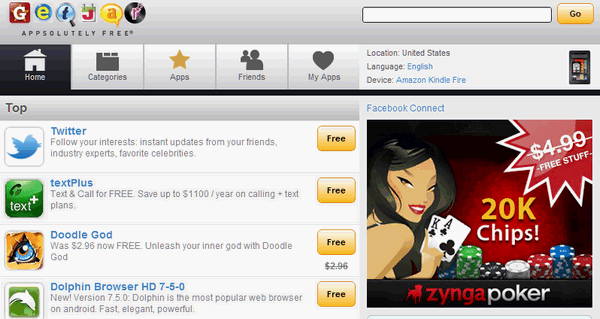 This unlikely named site has hundreds of apps and even has its own Kindle Fire section. When you first visit GetJar with your Kindle Fire – you’ll be asked to select your device – just select Kindle Fire and tap the OK button. You’ll see the main GetJar page and several featured apps you can use on your Kindle Fire. To see more apps just tap “more…” button. Most apps on GetJar are free -which is another bonus. So if you have a Kindle Fire, you’re not locked into the Amazon Apps store anymore. Try GetJar.com and you’ll find a whole new world of apps awaits you. I just got my Kindle Fire HD for my birthday last month. There wasn’t a book in the box, so it leaves me completely clueless as to how to use it! Thanks for this article….I shall see if I can do it on my Kindle. Thanks again!